Notice the distinct lack of tattoos in the picture on the right? And the long red hair? This was June 1992, I had quit my stupid light industrial day job the day before and was up in San Francisco (from Santa Cruz, where I lived at the time) with my friend Jayson to celebrate. I went over to Body Manipulations (they were still on Fillmore then) and Esther pierced me on her very last day in the shop before moving to Amsterdam to open their sister store. The one little bit you can see is my very first tattoo, that is now covered. The navel piercing was unlike any other: I got a strong rush of energy as the needle pierced me. It went in my third chakra and rushed out the top of my head, and I remember starting to laugh out loud. It was a good one. I started with a 14g steel captured bead ring in my navel piercing, which took a bit over a year to heal. Now, almost ten years later, it's still one of my most fussy piercings, and likes to flare up during ovulation if I don't take extra good care of myself. Piercing lore has it that the Egyptian royal family had pierced belly buttons and wore gold rings in their navels, and that this was easily facilitated by the fact that they all had deep navels due to inbreeding. If that is true, then navel piercing has been around for a very long time. Even if it isn't true, there haven't been many occurrences of navel piercing in history, and it's clearly more of a modern body piercing than ear, nose or lip rings. Although highly aesthetic on many navels, this is a very difficult piercing to heal due to placement on the body. The major physical qualification to getting your navel pierced is to have some sort of edge of extra tissue around your navel that can be clamped and pierced through. Nearly any form of any "inny" belly button will work, but some people with "outies" have enough of an edge too. You should not pierce through tissue that is protruding from inside the navel formation, only skin tissue that is around the bowl of the navel. Placement is most commonly somewhere between 11 o'clock and 1 o'clock but really any part will work if there is that definite flap of skin to go through. Comfort is best facilitated by placing the jewelry to work with the maximum depth of your belly button and how it sits as part of your overall abdomen. Trust your piercer, it's their job. Healing is easily six to nine months with at least 50% of people finally healing after a full year or slightly longer. Your midsection is highly active in overall body movement, the tissue is very muscular and the blood supply to the surface skin is much less than other pierced areas on the body. 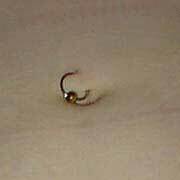 Clothing can easily irritate this piercing, and many people dress more loosely or have to make sure the waistbands of their clothing don't rub the jewelry. Freshly pierced belly buttons are sensitive to many kinds of soaps and even antibiotic ointments and washes. With navels, less is more for cleansing and healing. Try to clean the piercing once in the morning and once at night, and don't play with it in between. Once healed, there are a wide variety of captured bead rings, curved barbells, dangles and belly chains to wear. Navels are happy wearing surgical steel, gold, titanium and niobium. If you do sports or any kind of highly vigorous physical activity and your jewelry is in the way, you have a few options. One is to tape the ring down with a piece of first aid tape. Or you can take out the jewelry and temporarily replace it with a loop of nylon mono filament line of the appropriate thickness. 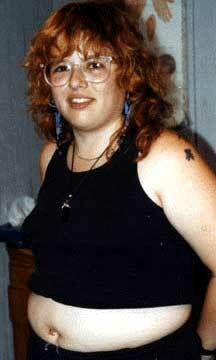 To the right you can see my new L-bar with topaz stones set into the beads, August 2001! I ordered it from Body Manipulations, my fave shop, and got it just in time to go river rafting on the Truckee River in early August. Very comfortable to wear, and I'm enjoying the sparkle.